This is a very well known phrase now. I’m traveling in Greece and while I might not be able to read words spelt with math symbols, all the visual clues are there to help me make sense of the world around me. No spoken language or reading required. 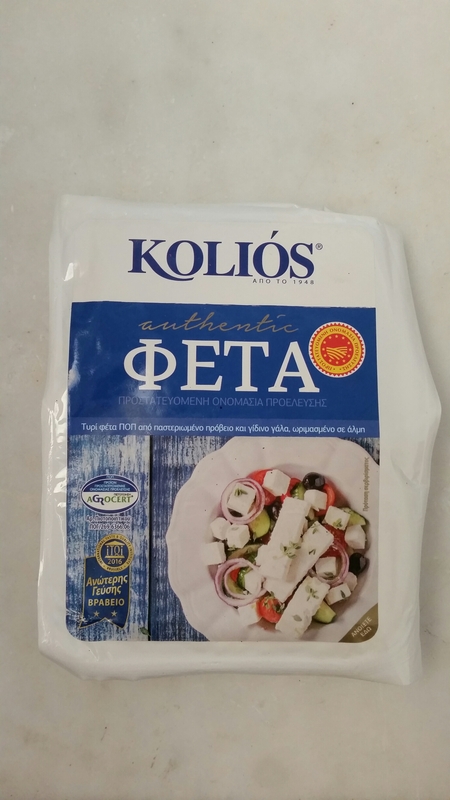 Even though this has Φ (phi) in the name, since the word feta comes from Greek it is easy enough to read. The type of packaging gives it away as well as the photo of the product. Even when it comes to instant coffee, the packaging and images gives it away instantly. It doesn’t matter that I can’t read the Greek. All the instant coffee containers have to keep the product dry and have room in the lid for a spoon to fit in. They are usually glass, and we can actually see the product to see how dark roasted and finely powdered this exact product is. However, in Greece they have something entirely different to this as their usual coffee they make at home. Even at a coffee shop you might see italian words and think you know what you are buying and be wrong. The common in Greece Cappuccino Freddo is more of a direct translation from the Italian (coffee with milk, cold) than what we are used to in Australia. The milk, despite not being able to read anything was also easy to spot. This time it was product context. It was in a fridge at the supermarket. There are lots of similar looking bottles and tetra paks, where possible, you can see that the product is white and liquid. The packaging has Arabic numerals with 1% or 3.5% so if you know what these numbers mean in this context you know if it is full cream or light milk. The almond, soy and coconut milks, available in the same fridge, has pictures of the ingredients. Now when box is not see through and nothing is recognisable… context. This package is cardboard. The opening is a semi-circle on the side of the package at the very top, spout like. It has sparkles and drops/bubbles/movement. It was found at the supermarket with laundry powder, liquids, bleach etc and was next to Tide a very famous and recognisable product. We have laundry powder. Washing machines are very hard to deal with in a foreign language. I used Google translate to work out the text written for the settings. When the machine didn’t work, the product manual, also in Greek, was not helpful. But again, despite not reading the language it is fairly easy to get a washing machine to do what it needs to do. While looking at toys, puzzles, books and games (a few of my favourite things) I noticed most board games use the English name. Up Words however went for a Greek name. Familiarity with the game and this packaging helps me to know what this is and even guess what the name might translate to. I don’t think I’ll be able to play the game though, those Greek math symbols look too tricky to write words with. My favourite instantly recognisable Greek alternative was the Mr Men books. It is always fun to see translated copies of wonderful books! And even though I’ve seen these translated into many languages, I’m always happy to see that they always look the same (same pictures, margins, fonts, spacing, size etc).